As we approach the end of the year, developers are scrambling to complete projects before they disappear for the holidays. 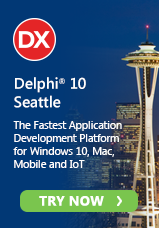 RAD Studio XE5, Delphi XE5 and C++Builder XE5 can help speed up your development and get those last minute Windows, Mac, and mobile projects completed before you take some well-deserved time off. With XE5’s rapid application prototyping, multi-device development, LiveBindings, FireDAC optimized SQL database access components and more, you’ll be smiling as you walk out the office door for your holiday and end of year adventures. Besides all the great capabilities in XE5, we also have some wonderful year end special offers as an extra special bonus for you.